Wild File Q& A: Are African honey bees here? Are they dangerous? Q: Are African honey bees here? Are they dangerous? A colony of African honey bees chose to settle on a high tree limb along the Marsh Trail, where they do not pose a threat. A: According to Dr. Jamie Ellis, entomologist at the University of Florida, approximately eight out of ten wild honey bee colonies in Florida south of a line from Tampa to Daytona are the African honey bees, often referred to as the killer bees. No honey bees are native to North or South America. European settlers brought a temperate European subspecies with them when they colonized the Western hemisphere, and that species is the common honey bee. The African honey bee was first imported to Brazil in the 1970s by a beekeeper hoping that using a tropical subspecies from Africa would provide more productive honey producers in tropical Brazil. Escaped queens enabled the subspecies to spread across South America, Central America, and the southern and southwestern United States in just 30 years. It is the most biological successful invasive species. Both subspecies defend the territory around their colonies, which is the only time the bees will be aggressive as a group. But when a European colony is disturbed, on average only 10-15 bees attack. 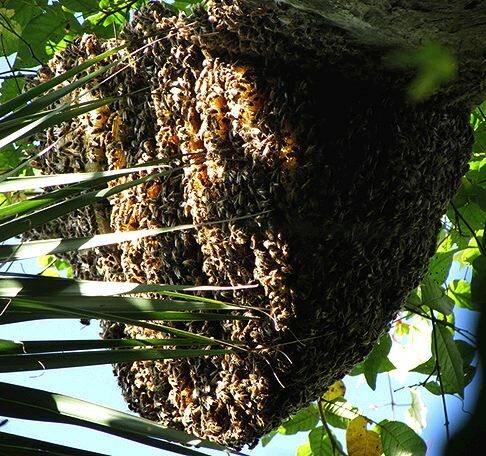 When an African colony is disturbed, 10,000-12,000 bees attack. usually pose any sort of risk. When bees attack, it is always to defend the colony. Dr. Ellis said that the ONLY defense is to run away as fast as possible. Once out of the bees’ territory, the attack stops. Several dozen stings will be painful but not lethal. disturbed, which is a lot longer than people can hold their breath under water. If an attack occurs, survival is the only concern. It takes 5-10 stings per pound of body weight before the attack may be lethal, so barring allergies to bee stings, a 100-pound person could survive up to 1,000 stings. victims instead of one. Call 911.